Manchester Madness offers a wide range of products and services at incredibly low prices in Australia. These Manchester Madness promo codes expire soon, so don’t forget to bookmark this page now. Manchester Madness free delivery offer: Get excellent quality home decor products & enjoy free shipping on orders over $100. 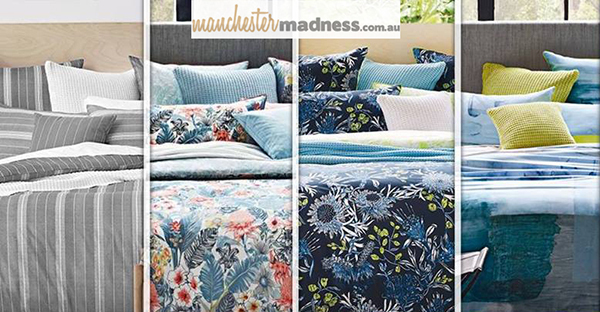 Seasonal Manchester Madness deal & sale: Retro Home Summer Quilt cover set comes for only $35.95 from Manchester Madness. Buy now to save more! Exclusive Manchester Madness voucher codes: Apply this code to buy bathroom accessories from just $20.95 at Manchester Madness. Limited time Manchester Madness coupon: Buy baby blankets from as low as $19.95 at Manchester Madness. New Manchester Madness discount: Sign up to get email updates & save $10 on your next order at Manchester Madness. Building a home entails a great deal of passion and attention to detail. But that doesn’t always mean you need to be extravagant. Especially with the premium, yet affordable collection of Bed Linen, Bath Linen, Home Accessories as well as Kids and Baby Products from Manchester Madness, this is a mean feat! Carrying forth a legacy of grandeur over three generations in product offerings and impeccable services, the company has started off as a wholesale business based in Sydney and Canberra. As of today, Manchester Madness has evolved into a much-loved retail store that caters to all the needs of the modern home owner with great finesse. Trending the hash tag of #loveyourhome, this online store has been nominated as a Google-Trusted Store owing to its seamless customer service, swift shipping time and peer reviewed ratings. Is it really possible to transform your bathroom into your own beautiful day spa? What is the answer to the ‘great mattress debate’- foam, spring or latex? How does one go about designing a gender-neutral nursery? Look no further, because the Manchester Madness Blog serves as an A-Z guide to beautify or stylizing your home. From useful ‘how to’ and ‘daily living’ articles, to the latest industry news on home essentials, there’s room for every taste, passion and purchase decision here! Also you can visit Sheridan Outlet for more similar range of products and browse the deals section. Here you can find best selling bed linen, blankets and towels at minimum discount of 70%. Decorating your home should be fun and we know that your shopping experience should be, too! To make your home decorating experience easy, enjoyable and budget saving, we suggest you to have a look at our Home & Garden section. Enjoy shopping at the biggest brands and save big using various coupon codes. Discover the best deals on your favourite t-shirts and jeans by subscribing aeropostale.com email updates with discount of 5% on your first order! Hold your breath for the Clearance Sale! With branded merchandise made available from prices as low as $19.95, home-owners need not worry about budgeting ever again! Many more of such fantastic offers and slashed-down prices await you at the ‘Sale Section’ of Manchester Madness! Hungry for more and more offers! Then you surely need to check out the Zanui online store to change the look of your home. Zanui provides the widest range of new stylish products for your home and ideas for home decoration with unmatched offers and promotions. Also, the seasonal sale lends additional discounts at next to make way for a happy shopping experience. Manchester Madness strives to offer the best prices available on all stocked items. All efforts are made to provide the lowest online prices for each and every product sold. Should you find an identical product from a similar Australia-based retailer for a lower price, please get in touch with Customer Care, for a price-match refund. Do check their ‘Product and Price Requirements’ prior to giving a call! Sign up for the Manchester Madness Newsletter for the most exclusive offers, news and deals. Also get a flat 10% off for your first order! Similarly signing up for Sheridan newsletter lets you enjoy gifts, previews, latest updates and more. Choose the colour, size and quantity as applicable. Click on ‘Continue’ to shop further, and keep adding all products likewise. Now click on the ‘shopping cart’ icon on the right-hand top corner of the page. Enter the code in the ‘coupon code’ field (next to ‘calculate shipping’) and click on ‘apply coupon’. You can avail the free delivery facility from Manchester Madness, on the purchase of $100 and above! All items in stock are dispatched within 24 hours of order placement, provided it is a weekday. All deliveries are carried out via Australia Post; the approximate time-frame for major metro cities would be 2-5 working days, and other regions would be up to 10 working days. If you are not satisfied with a particular product, please feel free to send the same back within 30 days of receipt. The item sent back should be intact, unused and with original packaging. Don’t forget to send an email to customer care with the description of the item being returned, the invoice number and reason for return. Please note that Manchester Madness currently ships products only to Australia-wide destinations. However, for high-volume international orders, you may contact the Customer Support Team and the feasibility of the order will be worked out accordingly. You can also send your queries via the contact form on the website.